Like the movie it captured on the printed page, Howard The Duck (ISBN 0-425-09275-5) has been doomed to ridicule. Unlike the movie, however, far fewer people remember it or know that it ever existed in the first place. This is a true shame. As the popular saying goes, one should not judge a book by its cover, and it can be argued that one should not judge a book by its movie, either. Because author Ellis Weiner took the humorous tone of the film (yes, the movie was a comedy, which many people failed to realize) as well as the sarcastic tone of creator Steve Gerber‘s original comics and turned the dial up to 11, giving us a novelization that, in some ways, is actually better than the movie on which it is based. More to the point, however: it is a book very much worth reading, especially if you could use a good laugh. Right from the beginning Weiner lets us know this is no ordinary movie novelization. 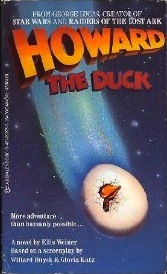 Chapter One opens with a booming narrative in all caps, thundering on about the cosmos, a boiling chaos of matter and energy, when it is suddenly interrupted by normal text (which we quickly discover is a seperate narrative voice) demanding to know what is going on and why this apparent intruder seems to be focusing on anything but Howard The Duck. We come find out that this booming voice is the VOICE OF THE UNIVERSE and for several pages the VOICE and the narrator struggle for control of the book toward which, of course, Howard himself is completely oblivious. Once the narrator wins, the VOICE goes largely silent, but we haven’t heard the last from it. Weiner combines thorough descriptions with humorous asides and sarcastic commentary to fully bring the story to life, and the characters are served the same attention. They’re given natural-sounding dialogue peppered with amusing irrelevancies and hilarious non sequiturs that keep the laughs coming at a steady pace. Once every so often a chapter is interrupted by a “Coverage-In-Depth Insert” which focuses either on a character or an object that may or may not have any great significance to the plot or the story as a whole, but is always a fun read as it provides an obscene amount of detail that we really don’t need to know, though we certainly come away feeling better informed, and also at the very least. One such insert tells us more about Howard’s homeworld than Howard himself ever does, while another details the events leading to the invention of a major weapon, giving us the skinny on everything from the scientists’ reasons for pursuing the project to what sugary breakfast cereal the President was eating the morning he conceived the device in the first place. Even Howard gets such a profile late in the story, which covers his childhood and shows us how he developed into the duck we all know and love. The plot, which follows that of the film, revolves around Howard being yanked away from his homeworld and dropped rather roughly on Earth, and his quest to find a way back. Along the way he meets Beverly Switzler (the only other character from the original comics to make it into this book or the film), who becomes his friend and awkward romantic interest. Beverly and Howard have their ups and downs, but they find themselves drawn together and the bond they share plays a big role in the decisions Howard is forced to make throughout the story. Things, of course, grow worse once the threat of a hostile alien invasion rears its head, and Howard finds that the cost of returning home may be a little too high for comfort. But, Howard being Howard, he presses on with his never-say-die attitude, confronting every obstacle with anger, defiance and usually a humorous quip. Weiner has great fun writing the quiet moments and the truly chaotic ones alike, and even plays little tricks on the reader throughout, such as randomly changing Lieutenant Welker’s name to Weber and back, sometimes within the same chapter (some think this was actually a printing mistake, but having read it as many times as I have, I’m convinced it was deliberate), and taking moments out of action scenes to provide us with more humorously over-detailed descriptions (“And then the TV, as though itself disgusted with the unremitting junk of the networks and the locals, blew the hell up!”). We even get a military parody of the Mickey Mouse Club theme song and a book-exclusive surprise or two, such as the form the Dark Overlord starts to take during the final confrontation, which I won’t reveal here. The book may be too goofy for some, and perhaps too detailed for others. For me, it’s a classic and an all-time favorite. Anyone who doesn’t laugh at SOMETHING in this book is either too serious or too inattentive, or just lacks wit. Whatever the case, this book is comedy gold and, if I had any say, it would be put back into print, because more people should read it. If you’re one of those who enjoys a good laugh or three and has some time to kill, it’s well worth it to track down and purchase a copy of this book. It has enjoyed a spot on my shelf since 1986, and it will keep that spot in the years to come.